Getting Started – It is a 2 Step Process. It is always about how you use the power of your mind. 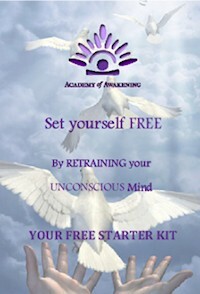 START NOW with your Free Starter Kit and begin to understand why you are who you are, and why you have reacted, in some circumstances, the way that you have. It is about the CHOICES you make. Download your FREE MP3 and make a difference with this very powerful gift. Get the support you need… join our Support Group and let the training begin. If you always do what you have always done and it doesn’t work for you right now – it is time for you to make your very own choice, to let go and move on to success and happiness in all areas of your life. Is it time for you to change your mind so that you can change your life with Empowering Affirmations and Emotional Freedom Techniques (EFT)? Always feel that you need to protect yourself? No matter how hard you try – things do not seem to go your way? Always working, with no time for fun? Having difficulties with your relationships with others? Does it seem as though whatever you do it is not good enough? Do you feel as though nobody ever listens to you? You can achieve whatever you set your mind to, by replacing old limiting beliefs with thoughts of new opportunities and possibilities. When you embrace what you really want instead of just expecting fear, on a daily basis at an unconscious mind level, you attract only goodness into your life. We have no idea what is stored and hidden deep in our unconscious mind, so now it is time for all of us to make the choice to change that which is not working for us. Take a moment and imagine, if you will, that you are not your past and that your past is simply building blocks to a powerfully positive future. I feel more and more inspired and filled with gratitude for the grace of God each day in every way. This track can be listened to anytime – Earphones can be used to enhance your listening pleasure. Track 1 has only the beautifully relaxing music by Thaddeus and the affirmations that you hear floating from ear to ear as you go to a beautifully relaxing space. This track can be used frequently, but please never use when operating machinery of any kind. Track 2 has subliminal affirmations which are the same as track 1 PLUS a powerful brainwave frequency for learning, and openness to awakening and is beautifully supported by the natural sounds of sunset waves rolling onto the beach. Please use headphones for track 2 This CD is best used as you drift of to sleep each night.